For A Proper Pretzel Crust, Count On Chemistry And Memories : The Salt The key to getting a good soft pretzel to brown properly is to dip it in a lye solution, the same stuff that's used to make soap. But a German mom insists it takes much more than that. Bavarian pretzels baked at the Goetz bakery in Taufkirchen, Germany, for the Oktoberfest beer festival. As Oktoberfest starts in Munich every September, my mom starts making pretzels in Michigan. She says the soft pretzels in the U.S. aren't like what she was used to in Germany, and if she's going to be hosting a backyard Oktoberfest, her food should be authentic. As a kid I watched the flour, yeast and salt whirl together in a food processor until suddenly congealing into a sticky ball. I liked to put my hand on the risen dough and pat it like a warm, soft belly. I helped dip the pretzels into something bubbling in the pot on the stove, careful not to touch the rolls after they were out of the bath. That's because that bath was actually a caustic alkaline solution. Traditional Bavarian pretzels are dipped in a lye solution before they are baked. Lye, also known as sodium hydroxide, is essentially the same stuff that's used to make soap and clean drains. It can even dissolve glass. But it's also what makes a good pretzel, says Wolfgang Büchler, owner of the Heidelberg Pastry Shoppe in Arlington, Va.. The shop is named after his German hometown. Büchler's employees snap on rubber gloves before dipping their handmade pretzels in the lye solution before baking. The solution, which Büchler imports from Germany, doesn't look like much; it's a dingy brown color. But it changes the pretzel's flavor and color in a way you can't really explain until you taste it, he says. Lye can be toxic in high concentrations, but is also commonly used for curing foods like lutefisk. Most bakers use food-grade lye, which is the chemical equivalent of drain cleaner, but is produced and packaged in a clean, regulated way. Since the lye dip is heavily diluted and the pretzel is baked after dipping, it won't kill you. 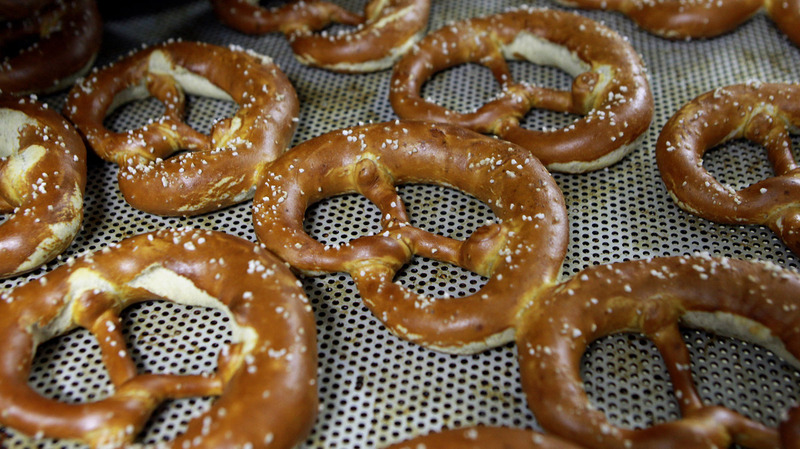 Nonetheless, Della Limbert, a tour guide at Julius Sturgis Pretzel Bakery in Lititz, Pa., says the Julius Sturgis factory prefers a less risky mix of hot water and special baking soda flakes instead. Those flakes are more caustic than the baking soda you buy at the grocery store, but not nearly as caustic as lye. They essentially do the same job. In case you were wondering, George Preti, a chemist at the Monell Chemical Senses Center, says baking soda maxes out at about 9.5 on the pH scale (which measures how acidic a substance is), while lye can get up to 14 (the highest ranking). The dipping process is an important part of pretzel baking — it doesn't matter if it's a Philly-style pretzel (shaped like an elongated figure eight) or a hard pretzel you'd find at a gas station (baked twice as long). "If you don't put a browning agent on the product, the pretzel is white," says Tony Tonelli, owner of Center City Soft Pretzel Co. in Philadelphia. "If you let it go into the oven white, it'll come out of the oven white." That's because the alkaline lye bath affects the way the Maillard reaction plays out when the pretzel bakes, says Bread Science author Emily Buehler. The Maillard process is integral to all bread baking — it shapes the way the crust forms and tastes. In the case of the pretzel, the Maillard reaction is responsible for the deep brown crust, crunchy arms and distinctive taste. At its most basic, the Maillard process is a heat-activated reaction between small sugars and amino acids. Dipping dough in lye alters the ratio between sugar and protein, because lye breaks proteins present in the dough into smaller bits. Those are the small amino acids that then combine with sugars in the dip to create the flavor compounds at the pretzel's crust. My mom always told me that lye was what made a German pretzel different from an American pretzel, but that doesn't necessarily seem to be the case. She doesn't even use real lye, she just puts in massive amounts of baking soda to make a stronger solution. But she still insists that she hasn't found a good Oktoberfest pretzel in the U.S.
Büchler says he tried buying lye in the states, but it doesn't live up to what he imports from Germany for his pretzels. And those commercial soft pretzels? Forget about it. "You get the same pretzel in a Philadelphia sports stadium that you'll get in the San Francisco stadium, in a Buffalo sports stadium, New England — you'll still get the same pretzel, which is a three-ring, frozen pretzel," Tonelli laments. My mom adds that the time the pretzel stays in the bath and the heat of the oven are also crucial. But maybe it's also partly that fresh-baked pretzels are a form of comfort food, reminding you of home, whether it's Philadelphia or Germany. If you want to make real Bavarian pretzels, here's my mom's recipe. It has the original Metric system measurements, so grab a kitchen scale for this one. In a food processor with dough-blade attachment, mix yeast, hot water, salt and flour. Place into a bowl and cover with a moist kitchen towel. Let the dough rise for about two hours. Mix baking soda into water and bring to a boil. Dip pretzels for 30 seconds to a minute, turn and leave in the solution for another 30 seconds. Take them out carefully with a slotted spoon and dry off, patting with a paper towel. Place onto a cookie sheet lined with parchment paper. Sprinkle with salt. Bake for about 14-20 minutes, until "nice and brown." Important: Avoid touching the dough after dipping it into the baking soda mixture, and keep it off of aluminum surfaces. It's not lye, but it's still corrosive.